The next 6 days leading up to my Seventh Full marathon at the Standard Chartered Mumbai Marathon on 15th January(9th run at SCMM including the Half-Marathons in 2004 and 2005) is going to be quite nerve wracking- I can sense the tension building up since Saturday(7th) evening. I was pretty much in the same state last year also. From my 4:42:28 finish in SCMM 2006 to the 3:52:48 in 2010 I have been successful in beating my goal every year specially at Mumbai with significant improvements in the last three years. However, this year's target of 3:45 looks daunting. This is the second Full Marathon that I have trained using the 'Run Less,Run Faster' program from FIRST. As per the race prediction table in the book I should be able to do a FM in 3:43:49 as my best HM time is well below 1:46:36( 1:43:33 at Mysore HM in Oct 2011). Nevertheless, in my previous FM of this season at Hyderabad, which was the previous FM for which I ahd trained using the FIRST program, I struggled to finish in 3:51:48. I ran a very fast first half in this race(1:45:17) which took its toll in the second half given the elevations in the course. To finish within 3:45 I need to do an average 5:18 per Km pace. I am as yet unsure about the race strategy to adapt this year. That is, whether to try and do almost even splits that I managed last year or to try and do a fast first half and sustain a good pace till 35Km. Given the way my pace has dropped in the last few Kms in the past , one option is to get to 35Km in 3:04 at an average pace of 5:15 per Km. This would leave me about 40 minutes for the last 7.2 Km at an average pace of 5:40 per Km. Last year I got to 29.9Km in under 2:44 at 5:28 per Km. I certainly need to be much faster this year. If I were to aim for even splits then I am looking at 21K in 1.51, 30K in 2:39 and 35K in under 3:06. So my goal will be to get to the half way mark between 1:46 and 1:50, 30K between 2:35 and 2:39 and 35K in as close to 3 hrs as possible. Of course, despite all the hard training of last several weeks(which has mostly gone well) a lot depends on the next few days and the race day itself. One needs to get to the race day adequately rested both mentally and physically. This means very little running and cycling the next four days(I will do one easy 9K and another easy 7K on Tuesday and Thursday this week and nothing after that) and reasonable amount of sleep every day with no undue tensions at work. On the race day itself there is a major dependency on the weather being favourable. One is hoping it will be at least as good as it was last year. The earlier start of 5:40am should help though the weather forecast as of now says it will be 23 Celsius at 6am going up to 27 by 10am! Finally to have a near perfect race one is praying there would be no issues with the stomach on race day , no recurrence of severe cramps and ache in the left glutes and hamstrings and the shoelaces don't come off(well even a few seconds matter!). I may even avoid taking a leak during the race or chewing on a energy bar and depend only on water and Gatorade to shave a few seconds - I will carry the bar with me though and decide during the course of the race. In races where I have a stringent time target I avoid talking to runners and try and stay focused on my pace - something that is tough to do at Mumbai with so many familiar runner friends. Familiarity with the route should help. 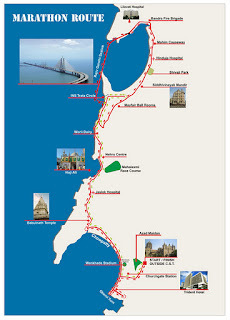 After some speculation in the press that the route might be changed this year it looks like it is going to remain the same as last year with the sea link round the 25th Km. I would of course be thrilled to hit my target of 3:45; finishing a minute or so below 3:50 would be satisfying; not bettering my PB of 3:51:48 would be a disappointment. One will know by this time next week. Here's wishing all friends running SCMM 2012 a great race!! Isn't sea link is in the first half this time ? Yes - Sanjeev - the sealink is in the 1st half this time in around 15th Km - I learnt this after my blog post.